A major issue for those opposing Trump’s southern border wall is that it is immoral. I will give the benefit of the doubt to those saying this by assuming they really mean that the principle of a border barrier is intrinsically immoral — surely not the concrete or steel itself. Nevertheless this charge mystifies me. I can think of several genuine and persuasive reasons for opposing such a wall. It will have at best minimal impact and it wastes precious resources that could be more fruitfully invested in our national welfare. But what is intrinsically immoral about wanting a physical barrier on our border? Start with the dictionary definition. 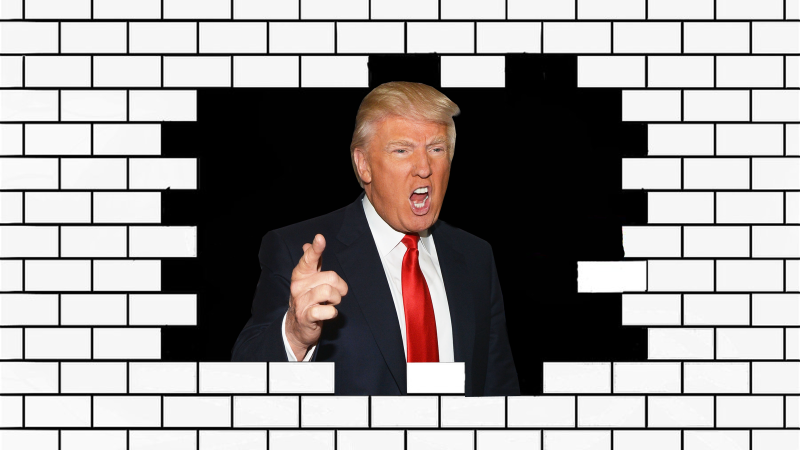 Would building a border barrier be wicked, dishonest or dishonorable? Not by any calm and impartial judgment. My best attempt at decoding this peculiar framework for opposition is that opponents see a wall as a symbol of exclusion and perhaps even bias or racism. It wouldn’t surprise me if many supporters of Trump’s wall harbor such disreputable beliefs, but certainly not everyone. In any case symbolism is a frail basis for litigating this issue. Try placing this in a local and personal context. Does your own home have any walls or barriers surrounding the property? Many estates have quite substantial walls surrounding them, yet I have never heard anyone refer to them as immoral. Yet all such barriers serve essentially the same purpose as a national wall. While they don’t obstruct a sufficiently motivated intruder, they do mark property boundaries and indicate that entrance requires permission. I suspect that the charge of immorality is really just guilt by association. Opponents of the wall are overwhelmingly opponents of Trump himself, and they almost certainly view him and his actions as immoral. Hence the wall must seem immoral in their minds. Perhaps there are more sensible reasons for this charge of ‘constructive immorality‘. I certainly hope so. The remaining objections — cost and utility — seem inadequate to justify closing down the government. If that became a common standard, very little that the government actually does would survive. Many speak of Trump’s racist America First movement as if it were a new phenomenon in the United States. It isn’t. In fact it is no more intense, bigoted and widespread than the last outbreak. Take this photo for example. Do you think it was taken in Charlottesville this year? No, it wasn’t. This was from the 1930s in Anytown, U.S.A. There is a book coming out soon that provides a scholarly look at this disease on the body politic from three-quarters of a century ago. It is called Hitler’s American Friends. Here is a blurb from Amazon. The U.S. population in 1938 was about 130 million, many of whom were children. It is thus likely that at least 20% of the adult population were sympathetic to Hitler’s cause in the period leading up to WWII. Many others didn’t much like either side but were vehemently against entering the war, scarcely two decades after WWI, and thus they aligned themselves with the isolationist clique. 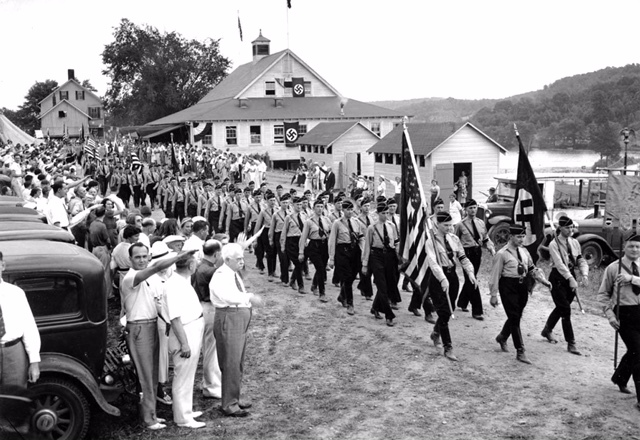 The pro-Nazi German American Bund held great rallies in places like New York City, St. Louis, and Chicago. Today they would dominate the news the way Trump’s incessant rallies do. Keep in mind that the 40% or so still supporting Trump are not all American Firsters. Many are Republicans who simply oppose Democratic candidates and policies. And in any case, that number applies only to voters, who are no more than about 60% of the adult population anyway. 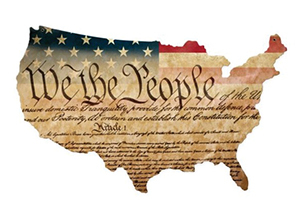 The preamble to our Constitution identifies those to whom it applies with the opening phrase “We the People of the United States”. But who exactly are these people? Recent disputes related to immigration, and in particular to illegal immigrants, make this a crucial legal issue. Focusing more closely, I want to address this question. “What exactly makes someone who is not a US citizen or a qualified alien eligible for constitutional protections?” Two Supreme Court decisions are most often quoted in reply to this question. In Kwong Hai Chew v. Colding (1953), the Court found in an 8-1 decision that a permanent resident of the United States could not be deported without a hearing under the constitutional right to due process. In Plyler v. Doe (1982), the Court held that a Texas statute which withholds from local school districts any state funds for the education of children who were not “legally admitted” into the United States, and which authorizes local school districts to deny enrollment to such children, violates the Equal Protection Clause of the Fourteenth Amendment. The issue of jurisdiction was found to be irrelevant. But note that both of these cases were understood to apply to persons who are residents of the US. So the issue devolves into what constitutes residency. Consider the following hypotheticals and see if you can discern a bright line that clearly indicates residency in the US. Have any of the following individuals established residency that is sufficient to qualify for constitution protection? Someone who approaches the US border and plants his left foot firmly on US soil? Someone who is standing in Mexico, while waving one foot in the air over US soil? Someone flying over the Aleutian Islands on a trip from Canada to the Far East? Someone who trips on a tree stump in Canada and lands on US soil? Someone who falls overboard into US territorial waters while exercising free rights of passage? Can you answer these questions confidently, using a clear and unambiguous rule? I believe that I can. The writers of our Constitution never intended that incidental or even deliberate touching of US territory in and of itself confers any kind of claim for Constitutional protection whatsoever. They intended this to apply only to those who purposefully enter our territory, with our explicit or implicit permission, and with the clear intention to remain more than momentarily. There is no other possible reading of either the Constitution or our founding documents like the Federalist Papers. Thus, my answer to all of these questions is “None have established residency.” Do you disagree? Now consider how the preceding might apply to those sneaking over our southern border. At which point will they have established residency? We have both laws and customs that grant a hearing for claims of refugee status from prospective immigrants. But as far as I know, we have no laws that grant status to those who can’t find sustenance where they now live, or who are at risk from endemic criminality in their homeland, or who simply want a better life for themselves and their families. For those with valid refugee claims, we have policies and procedures in place to process them. But none involve sneaking over our borders. It is fair to respond that our policies are sometimes overly restrictive and are almost always ponderously slow. But if we can truly claim to be a nation of laws, then these criticisms cannot override legal considerations. The bottom line seems to be that people trying to avoid our ports of entrance don’t achieve resident status thereby, and hence they are not yet one of “We the People of the United States”. We can grant them due process at our discretion, but I see no constitutional requirement to do so. However, it remains an open question for those clever or lucky enough to escape detection and actual take up residency within our borders. Republicans began this term with a two-seat majority in the Senate. That means that they can’t pass anything at all controversial unless they can hold on to at least 50 members of the Senate. I think that may no longer be possible. 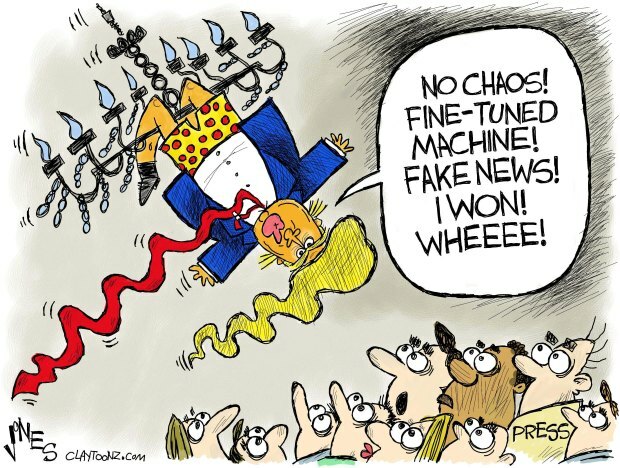 By his own antics, Trump has broken the party. Two of their caucus, John McCain and Bob Corker, are basically now permanently opposed to almost anything that Trump wants. Neither has to worry about being re-elected and their open disdain of Trump is evident. 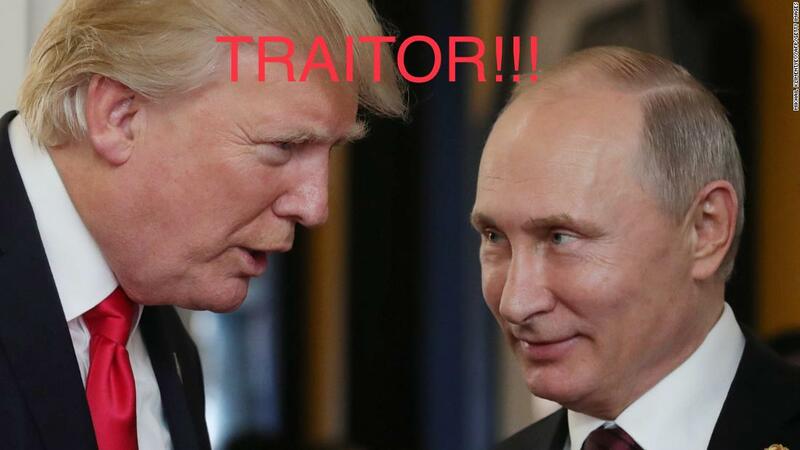 Both are traditional conservatives who have little in common with this President, who basically hijacked their Party. In addition, Rand Paul may agree with some of Trump’s agenda but certainly not with his incoherent methods, and he probably thinks that Secretary Tillerson was right when he called Trump a moron. The female Republican senators don’t approve of some of Trump’s agenda, and they have every reason to despise him personally. Other senators have good cause to bear a grudge against Trump because his juvenile antics and insults annoyed the hell out of them during the campaign and afterward. They may be currently reluctant to take him on because of his cadre of stubborn supporters, but that will wane as the administration fails again and again to produce anything worthwhile. The bottom line of all of this is that the only way Trump will achieve important legislative goals is by toadying up to the Democrats. He could do that, and in fact has already done so once, but as a general legislative plan this would probably be the final straw for Congressional Republicans. I don’t think we need to wait for the fat lady to sing anymore. The Trump Presidency is toast. With respect to the proposed wall on our southern border, I think I have it right that Democrats oppose it — vehemently — and Republicans, by and large, favor it. I understand the Republican position. They seem convinced that it will help solve our illegal immigration problem. But barring building a Berlin-type barrier with electrified fences, mines and machine guns, I frankly doubt this. A complete wall built according to current proposals will likely have some effect, but people will find a way across our border if the economic incentive is sufficient. However I am a bit puzzled by the Democratic opposition. I searched the internet and none of their spokesmen make a clear and unambiguous statement about this. I would have thought that wasting all that money that could be put to better use would be an obvious reason, but they never seem willing to put it quite that baldly. Still, I assume that this is basically their position — and mine, too. But here’s the problem. Both of the top Democratic leaders, Sen. Chuck Schumer and Representative Nancy Pelosi, have stated in clear terms that, if funding the wall is included in a bill to raise the debt ceiling, Democrats will vote to block it. This situation will likely arise in December. 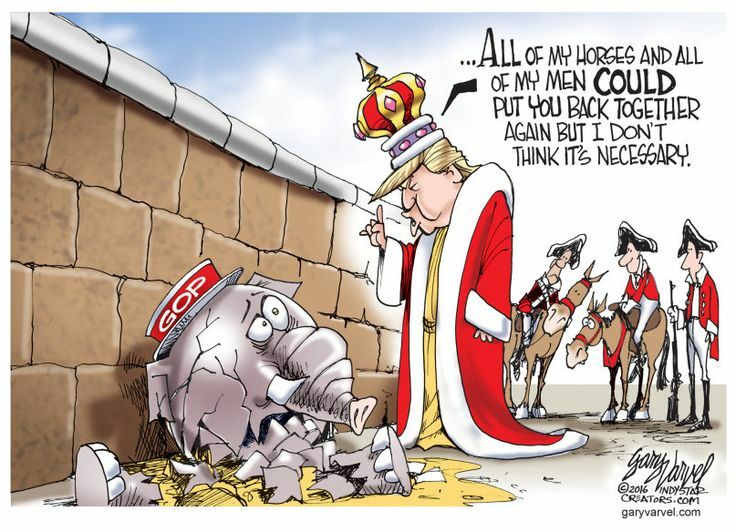 They are fully aware that Democratic votes plus those of the extreme right in the Republican caucus will prevail. In other words, they are willing to sabotage the nation’s credit, drop a bomb on our economy, and risk significantly increased interest rates rather than wasting some money on the wall. On its face that doesn’t make economic sense. In fact, it defies logic unless there is something more at stake than wasting a few billions. So, what exactly is the real issue? And is it really worth that much? Knowing Democrats, my theory is that this isn’t a money issue at all, or at least not in its essence. There is something about building a barrier on our border that strikes at the very core of progressive ideology. To many Democrats, it’s a bit like tearing down the Statue of Liberty, perhaps combined with making English our national language. 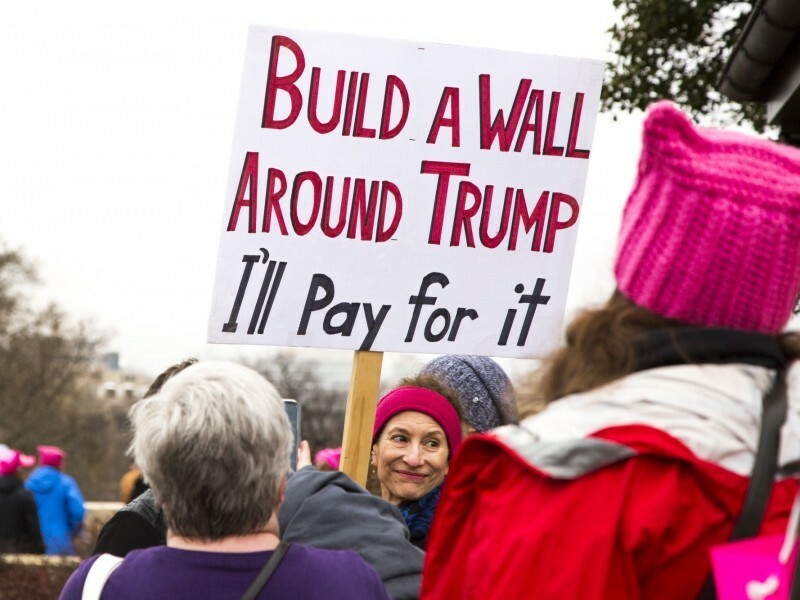 The wall has become a symbol of exclusionary philosophy that is anathema to old-style Democrats. So perhaps they would indeed risk an economic catastrophe rather than conceding this point. Of course, this is just a theory. But if it is true, then Democrats are about as nutty as Republicans, which is a standard that is rather hard to meet.